A name change, buying SolarCity and a bet in Australia are all part of CEO Elon Musk rebranding his $50 bln creation as an energy company. But SolarCity bosses have left and virtually all income is from autos. Tesla’s future rests on making the new Model 3 a mass-market success. 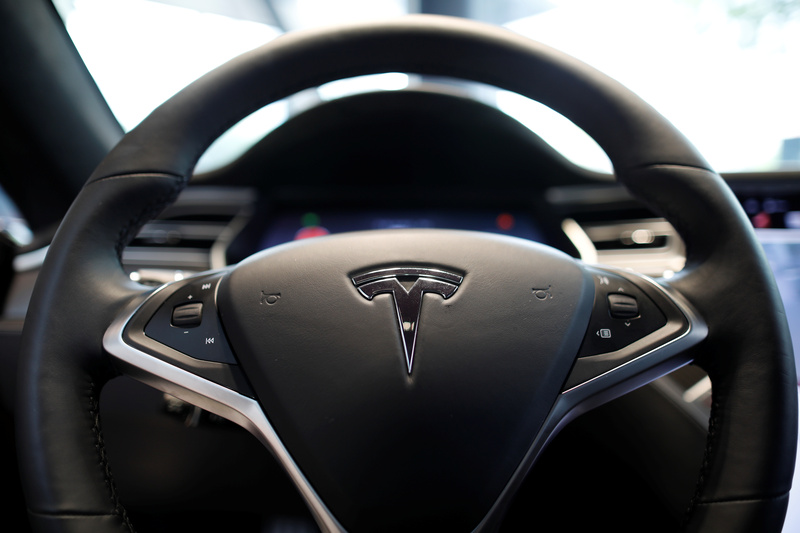 The logo of Tesla is seen on a steering wheel of its Model S electric car at its dealership in Seoul, South Korea July 6, 2017. Tesla is set to report second-quarter earnings after the U.S. stock market closes at 4 p.m. EDT on Aug. 2. The consensus estimate of sell-side analysts is for a loss of $335 million, or $1.83 a share. On July 28 Tesla officially launched its Model 3 mass-market sedan. Chief Executive Elon Musk said at the launch event that customers had placed more than 500,000 advance reservations. He said the company is "going to go through at least six months of manufacturing hell" as it attempts to increase production of all its vehicles to a rate of half a million a year by the end of 2018. On July 31 a group of Tesla employees calling themselves the Tesla Workers’ Organizing Committee sent an open letter to the automaker’s board to raise concerns about “challenges that are holding us back from working as effectively and efficiently as we would like.” They referred to an above-average injury rate, a lack of guidance, high turnover and insecurity. They also asked for more of a voice in the company, about pay and health and safety as well as in identifying problems and solutions with Tesla’s manufacturing process. Tesla confirmed on July 18 that Peter Rive, co-founder of SolarCity, would be leaving the company. Tesla bought the solar-panel installer last year for $2.6 billion. Rive’s brother, co-founder and former Chief Executive Lyndon Rive, left Tesla earlier in the year. Tesla founder and boss Musk is their cousin.